Can you believe that it's March already? and I have one to share with you today. With a new month comes a new project for Ephemera's Vintage Garden. This time we will be working with the fabulous kit called "Gentlemen and Scholars". 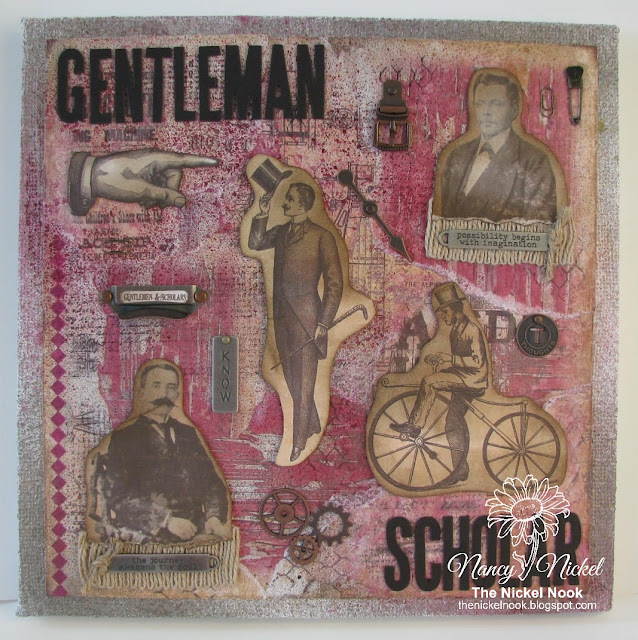 After printing this kit out, I was inspired to create a mixed media canvas. I got very excited when I heard the name of this kit. Are you familiar with the line "You're a gentleman and a scholar..."? It's actually a quote from The Catcher in the Rye by J.D. Salinger. I remember my brother using this line in our younger years. If he wasn't gone I would gift this to him but I enjoyed thinking of him as I created it. This was such a FUN project to make! just to show you how easy it is. I began with a 12 X 12 Tim Holtz District Market Burlap Canvas. I gave it a coat of white gesso. Next, I printed out the pages of the printable journal kit. and arranged them in a pleasing manner on the canvas. The papers were kept from the edge, so that the burlap would still show. I then adhered all the papers in place using matte multi medium. I left it alone until it had air-dried. I sprayed the entire canvas...even the burlap edges. Again, I let it air dry. Then I pulled out several texture stamps, and used black archival ink to stamp the canvas. You can click on the photo to see the detail. All that was left was the embellishing and decorating. I fussy cut the elements I wanted to use from the kit. I cut the title words out of black chipboard. Finally, I raided my hoard of Tim Holtz goodies and scattered them about the canvas. to which I added a quote band. You can also see the gears and the word stick. In the top right corner I placed another gentleman. along with another quote band. You can see that these metal embellishments are perfect for this collection. I liked this hand placed under the "GENTLEMAN" and pointing at the gentleman. I cut the collection title from one of the printed pages, and placed it in the label pull. It was the perfect fit! You can also see the background details in these photos. This final angle shot shows some of the dimension. Please let me know if you have any questions about anything. Love this Nancy! Very nostalgic with the sepia toned images and I like all the charms and hardware too. Gorgeous canvas Nancy and it is so cool to see your creative process! What a wonderful result "playing" has done. Great work. What a fun project, Nancy! I love the variety of papers in the background, and all the gent ephemera, too! Thanks for sharing this with us at the Simon Says Stamp Wednesday challenge this week! What a great project Nancy! I love that it brought up memories of your brother and made you think of him! I have a question and maybe either you or Debbie-Anne can answer this for me. I tend to shy away from images that I purchase, download and then print off myself because I'm afraid of the amount of ink I will go through on my printer. Any suggestions/ideas? Awesome! This is just Fabulous...thank you for sharing with us at Crafty Gals Corner.